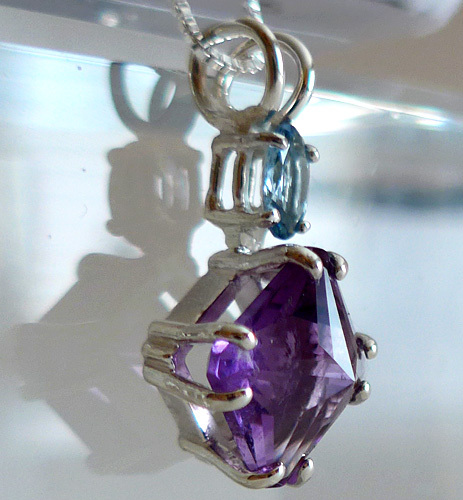 This beautiful Amethyst Mini Magician Stone crystal pendant is crowned with a large, brilliant slim oval cut Aquamarine gemstone of exceptional quality, both in the style of the stone and in the simple silver band setting which allows the stone to breathe and function at its highest vibration. 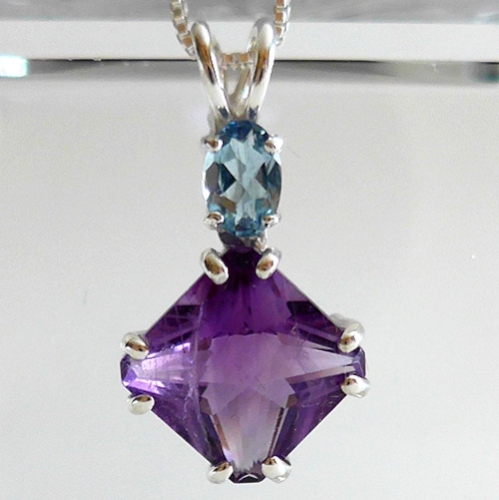 The combination of amethyst and aquamarine makes for a splendid Higher Worlds access and should increase ones ability to communicate through the spiritual heart. This precious stone assists us to assimilate new knowledge while remaining true to our own highest nature. Aquamarine helps judgemental people to become more tolerant by reinforcing the connection with the Higher Self while clarifying mental activity of all kinds. It is a stone which encourages flow, balance, protection & clarity, attuning us to spiritual worlds while enhancing the connections between our intellectual, emotional and spiritual bodies. Because of its unique property of activating the throat and third eye chakras and clearing the connection between the two, aquamarine is said to infuse the user's mind with the ideal of service to the world, and to help the user develop a strong commitment to furthering the spiritual development of all humanity. This same property provides the user with increased access to the akashic records, the energetic templates containing the patterns of perfection that govern the birth, growth and development of the human body (the microcosm) and the universe (the macrocosm). Note: Weight above is shipping weight. Average actual weight is 4.706 grams. Each piece is unique made of natural stones and may vary slightly in appearance and dimensions. Each piece is guaranteed to be beautiful and to meet with your complete satisfaction!